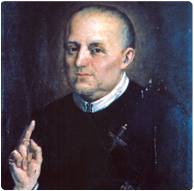 St. Clement Hofbauer was born in Tasswitz, Moravia (now the Czech Republic), on December 26, 1751. In his early youth, after the death of his father, he worked as an apprentice baker. Having become a servant in the Norbertine Abbey at Klosterbruck, he was able to follow the call to the priesthood by completing first his secondary schooling and then his catechetical, philosophical, and theological studies in Vienna. During this time he made yearly pilgrimages to Rome, where he met the Redemptorists. On October 24, 1784, with his friend Thaddeus Hübl, Clement entered the Redemptorist Congregation. Both men professed religious vows on March 19, 1785, and were ordained priests on March 29. As vicar general of the Congregation north of the Alps, Clement founded the first house of the Redemptorists in Warsaw, Poland. Other houses were established in Poland, Prussia, Germany, Switzerland, and Romania. He lived in Warsaw from 1787 to 1808, and with the collaboration of lay people of various nationalities, he developed a very fruitful apostolate, promoting good works and strengthening the piety of the faithful. Clement established the northern European Redemptorists in an era when the Church was attacked by intellectuals, society, and government. He was surrounded by enemies but continued to love and forgive them. He fully lived the message of today’s Gospel to love one’s enemies. While in Warsaw, begging for funds for his orphanage, he entered a pub where a patron spit in his face. St. Clement responded peacefully, “That was for me. What about something for the orphans?” The patron was moved by his response and made a significant contribution. With the takeover of Poland by Napolean, the Redemptorists were suppressed, and Clement—forced to leave Warsaw—made his way to Vienna. In 1813 he was appointed rector of the church of the Ursulines. Through his gifts of spiritual direction, preaching, confession, and works of charity, he converted and helped people of every social class. Clement’s activity influenced the Congress of Vienna and the culture of the time, especially the Romantic Movement. He died in Vienna on March 15, 1820 and was canonized by St. Pius X on May 20, 1909. He is co-patron of both Vienna and Warsaw. The shrine of St. Clement Hofbauer is in the church Maria am Gestade in Vienna. 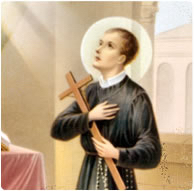 St. Gerard Majella was born in Muro Lucano, Italy, on April 6, 1726, into a humble family. From his parents he learned the love of prayer and sacrifice. When his father died, Gerard, being the only son, had to provide for his family by working as a tailor. At the age of 14 he sought to enter the Capuchin friary but was rejected because of his poor health. After a short time as the domestic servant of the bishop of Lacedonia, he returned to tailoring but earned a minimal income. In April 1749, after attending a Redemptorist mission in Muro, Gerard succeeded in getting himself accepted by the congregation. Following a trial period and a year of novitiate in the house at Deliceto, he professed religious vows on July 16, 1752. Gerard was noted for his observance of the Redemptorist rule and collecting money for the material needs of the community. His presence to people who were weighed down by poverty and illiteracy was a sign of hope to them. Gerard had great empathy and testified to trust in the love and the compassion of God. During his five years as a lay brother in the congregation Gerard was remarkable for his apostolic zeal, patience in sickness, love for the poor, deep humility in the face of false accusations, heroic obedience, spirit of penance, and constancy in prayer. He wrote numerous letters of spiritual direction. The Lord favored him with many spiritual gifts, including prophecy, the ability to read people’s hearts, and the gifts of miracles. He died at Materdomini on October 16, 1755. Gerard was canonized by St. Pius X on December 11, 1904. He is invoked as a patron of mothers, especially in time of pregnancy. Couples hoping to conceive a child also seek St. Gerard’s intercession. John Neumann was born in Prachatice in Bohemia (now the Czech Republic) on March 28, 1811. He studied theology in the seminary of Budweis. Zealous for the missionary life and to lead souls to Christ, he decided to leave his homeland to dedicate himself to European immigrants in America, who were deprived of spiritual support. John was ordained a priest by the bishop of New York in June 1836 and gave himself to the pastoral care of people in the vast area around Niagara Falls. Wanting to live in a religious community that corresponded more to his missionary vocation, he entered the Redemptorists in January 1842. A tireless missionary, John busied himself in particular with German immigrants, first in Baltimore, then in Pittsburgh. Having filled the role of vice-provincial superior of the Redemptorists from 1846-49, he became the parish priest of St. Alphonsus Church in Baltimore. In 1852, at age 41, he was named bishop of Philadelphia. In just seven years he built 89 churches as well as several hospitals and orphanages. As a bishop, John was untiring in visiting parishes throughout his vast diocese. On January 5, 1860, at age 49, he died suddenly of a heart attack on a Philadelphia street. John was beatified during the Second Vatican Council on October 13, 1963, and canonized on June 19, 1977. 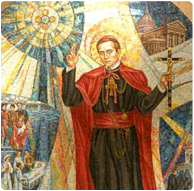 St. John Neumann is the first American man to be made a saint, and he is invoked as a patron of sick children and of immigrants. The National Shrine of St. John Neumann is in Philadelphia, at St. Peter the Apostle Church. Many other Redemptorists have been beatified. Click the links to read more about them.